Michael Foster, Chief Executive Officer of Kavango Resources, commented: “We are pleased to announce the successful conclusion of SkyTEM’s AEM survey covering the northern part of KSZ project area. The KSZ project covers over 9,000 km2 of prospective ground for the discovery of base metal deposits in southwest Botswana. The Company has now covered approximately 50% of the KSZ licence area with airborne geophysics. The key now is for a thorough ground follow up plus of course drilling of further priority targets over the coming months”. Kavango Resources plc (LSE: KAV), the exploration group listed on the Standard List segment of the main market of the London Stock Exchange and targeting the discovery of world class mineral deposits in Botswana, is pleased to announce that Phase 2 of its airborne electromagnetic (AEM) survey carried out by SkyTEM over the northern section of the Company’s Prospecting Licences that cover much of the Kalahari Suture Zone (KSZ) structure in southwest Botswana, has been completed. · Results of the interpretation, with priority targets for ground follow-up and drilling, will be announced when they become available. 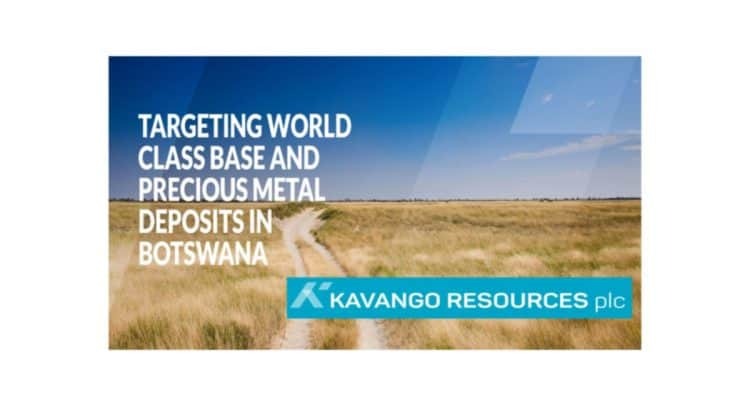 Further information in respect of the Company and its business interests is provided on the Company’s website at www.kavangoresources.com and on Twitter at #KAV. Kavango’s 100% subsidiary in Botswana, Kavango Minerals (Pty) Ltd, is the holder of 15 prospecting licences covering 9,231 km2 of ground, including most of the 450km long KSZ magnetic anomaly in the southwest of the country along which Kavango is exploring for Cu-Ni-PGE rich sulphide orebodies. This large area, which is entirely covered by Cretaceous and post-Cretaceous Kalahari sediments, has not previously been explored using modern techniques. The area covered by Kavango’s KSZ licences displays a geological setting with distinct similarities to that hosting the World Class Norilsk Ni-Cu-PGE orebodies in Siberia. Kavango’s exploration model is based upon the search for magmatic massive sulphide orebodies buried beneath up to 200m of overburden. The identification of drill targets follows a carefully constructed exploration program specifically developed by the Company for exploration in areas covered by Kalahari and Karoo sediments and sands. The exploration program is initiated by identifying the location of magmatic intrusive rocks from an analysis of the regional magnetic surveys published by the Botswana Government. This is followed by an airborne electro-magnetic survey (AEM) carried out over the magnetic anomalies that have signatures indicating the presence of intrusive rocks at depth. By using the latest generation of low frequency helicopter-borne EM, conductors lying below the Kalahari/Karoo cover can be identified for further investigation. These conductors can be tested on surface by very high sensitivity soil sampling*, which can detect metal ions transported from buried, metal rich massive sulphide deposits associated with the emplacement of magmatic intrusive rocks. *Kavango geologists have pioneered a high resolution soil sampling technique to detect ultra-fine metal particles which have been transported in solution from considerable depths of burial to the surface by capillary action and transpiration. Evaporation leaves the metal ions as accumulations within a surface “duricrust” which is then sampled and analysed. Zinc, which is the most mobile of the base metal elements (i.e. goes into solution easily) acts as a pathfinder to mineralization at depth.